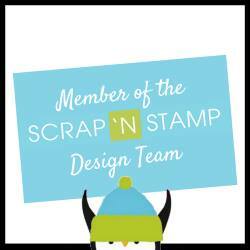 I think I have mentioned before that I am on the Design Team for the Clean and Simple Challenges at Splitcoaststampers. The challenge today is Winter/Holiday Critters. 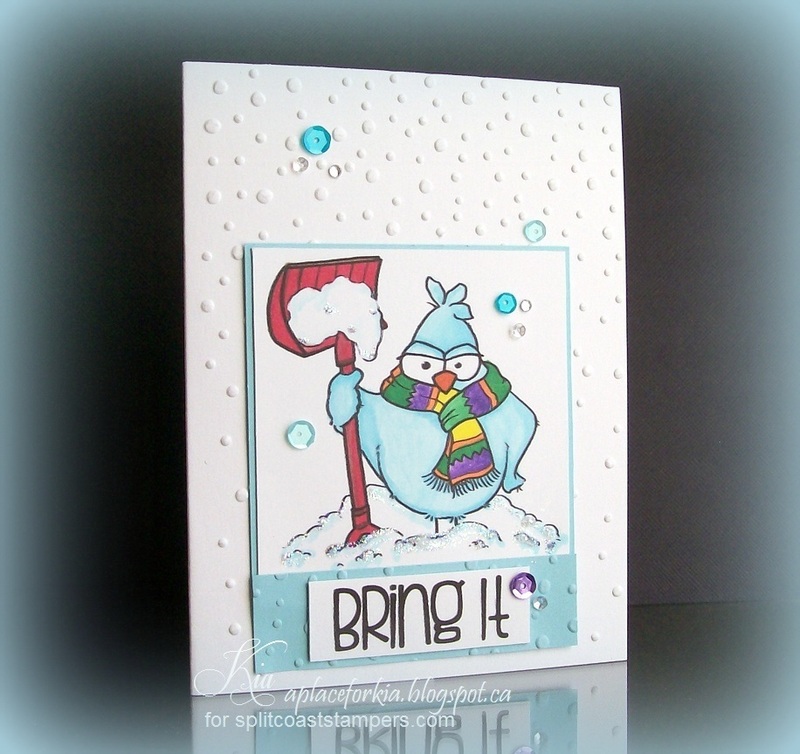 This image is From The Heart Stamps called No Snow Birdbrain which I coloured using Chameleon Markers. To highlight the snow mounds I added some stickles and of course sequins and gems to finish. 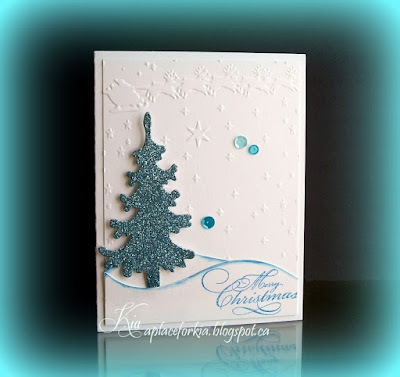 I embossed using Sizzix Snow Dots Embossing Folder. Thanks for having a peek. 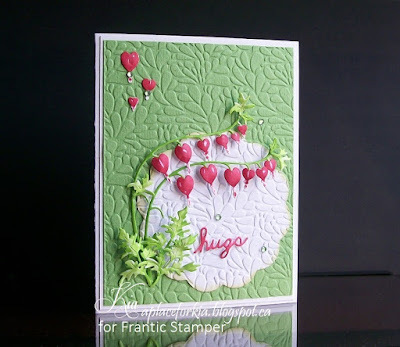 This card I made following a sketch from Splitcoaststampers and it is my final card for Caring Hearts. The paper I bought several years ago, it is from Bo-Bunny called The Seasonal Carol. 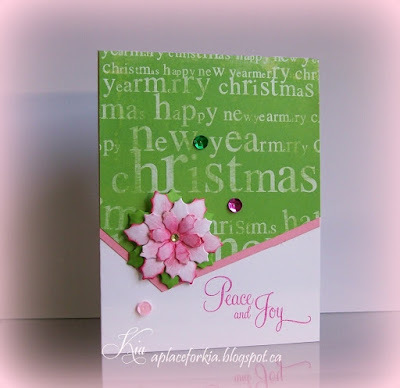 I cut it so the word Christmas would be just above my flower, which I sponged with picked raspberry ink. The leaves for the flower I did with Chameleon Markers, as they had the closest colour to the green I wanted. Stamped the sentiment and added only 3 sequins and 1 crystal gem in the flower centre. I hope you enjoy, and thanks for having a look. 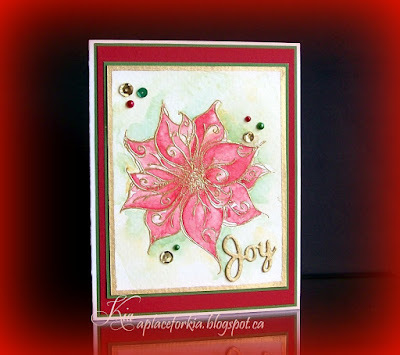 Products Used: Cheery Lynn Poinsettia Strip, Penny Black Christmas Cheer Stamp Set, Sequins, Crystal Gem. 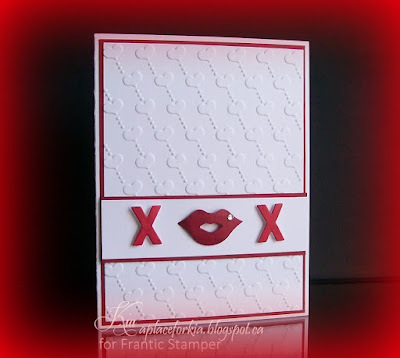 I did this for the Clean and Simple Challenge at Splitcoaststampers as part of the Design Team. The challenge is to use leaves. I have had these vellum leaves for years, but they are stickers and I am not fussed about stickers. So I applied scotch tape to the back, covering the "stick", trimmed and styled the leaves, then mounted on foam dots to the circle embossed die. 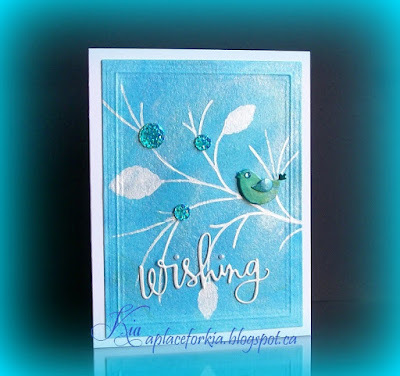 Added some glitter marker around the circle and along the edge of the card. 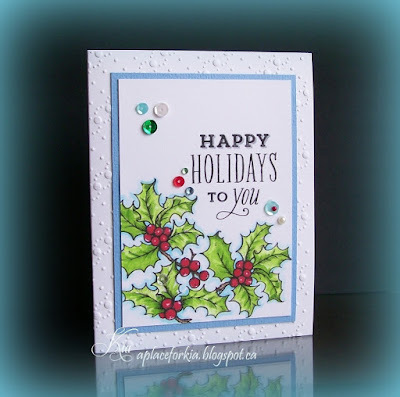 Stamped the sentiment and attached some sequins, crystals and pearls. Thanks for having a peek. 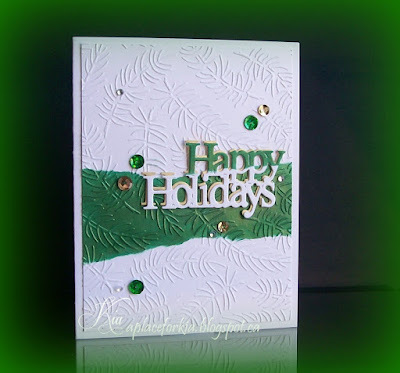 Products Used: Spellbinders Circles Small, Tim Holtz Fades Woodgrain Embossing Folder, Penny Black Christmas Cheer Sentiment, Sequins, Crystals, Pearls, Martha Stewart Glitter Markers. 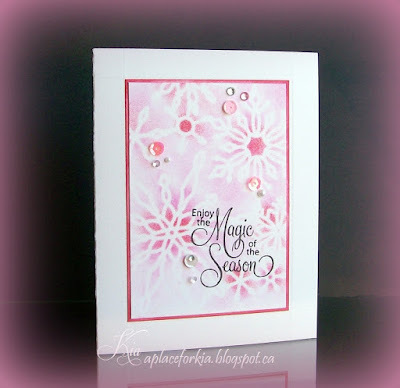 Products Used: Tim Holtz Distress Inks Picked Raspberry and Festive Berries, Memory Box Snowflake Flurry Stencil, Penny Black Christmas Cheer Sentiment, Sequins, Crystals, Pearls. 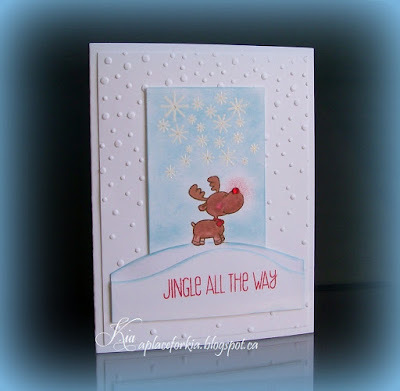 Products: My Favorite Things Jingle All the Way, Sizzix Winter Set Embossing Folder, Sizzix Snow Dots Embossing Folder, Impression Obsession Snowflakes, Spellbinders Scalloped Circles Small. Products Used: Frantic Stamper Linked Hearts Border Die, Frantic Stamper Valentine Confetti Die, Impression Obsession Greetings and Small Snowflakes, Crafts Too Love Hearts Embossing Folder and Martha Stewart Glitter Markers. 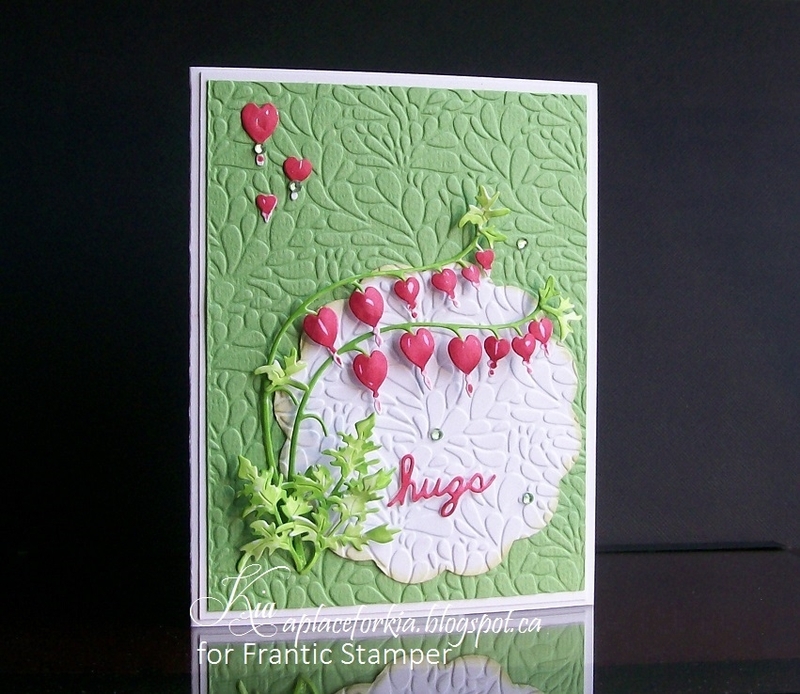 Another card to send to Caring Hearts. I really like this card, it is simple but I think very pretty at the same time. I knew when I started that I wanted my Star Border going on a slant. Many years ago I bought some Martha Stewart Glitter Markers. I was very disappointed as they did not work, and I had bought all of them at $30.00 plus taxes. 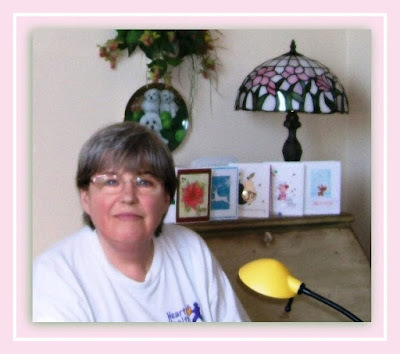 But, as a crafter it is rare for me to be rid of something that I might use. 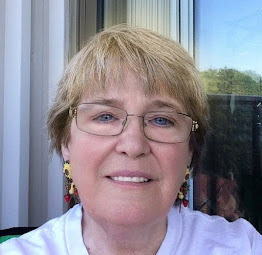 And, here we are today, I got them out and like magic, they all work! They just needed a few years rest. So, I went about colouring the negative of the stars with the silver marker, and added indigo to a few of the solid stars. 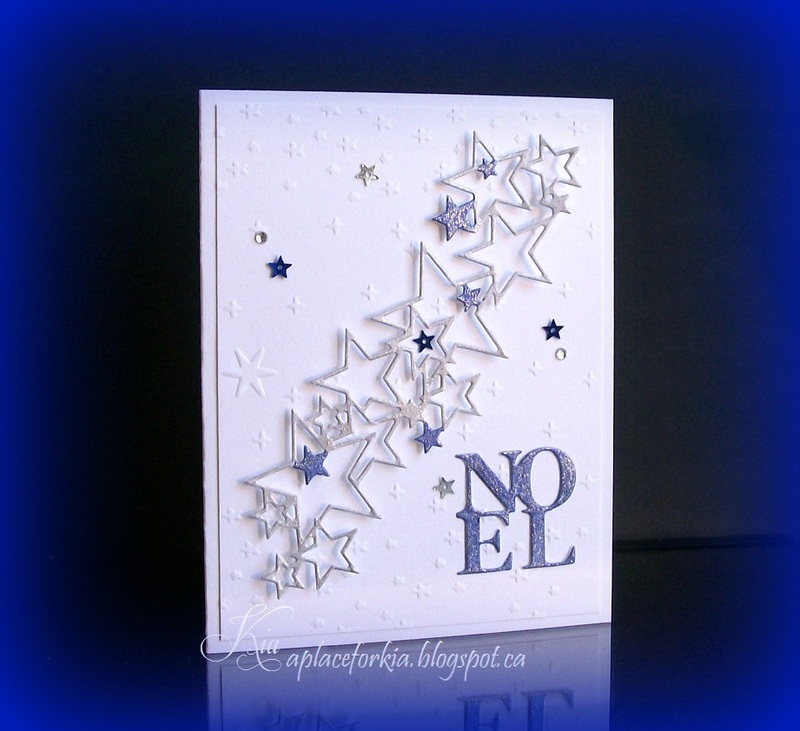 I cut the Noel and coloured it with the indigo marker. 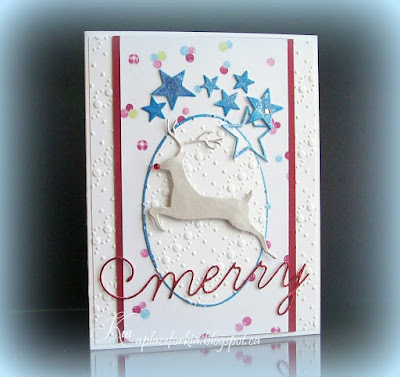 I embossed the background with a 6x6 embossing folder that if used properly would have Santa and his reindeer, which I did not want on my card, I just wanted the stars, so I turned my paper sideways and embossed only the stars for my background. The stars are mounted on foam dots and typically me I finished with a few star sequins in silver and blue and a few gems. 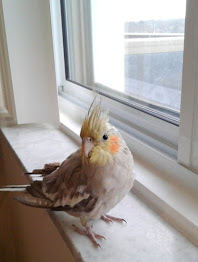 Thanks for having a peek. 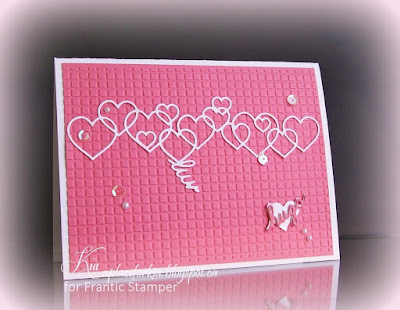 Products Used: Frantic Stamper Star Border and Noel Sentiment Dies, Crafter's Companion Embossalicious I Believe Embossing Folder, Martha Stewart Glitter Markers. This was a fun card to make. I stamped the little reindeer, then masked it over with masking fluid. I die cut the snowbank and stamped a bit of his hoofs on the bank and sponged ink along the edges of both snowbanks. I stamped the snowflakes using white embossing powder and sponged the ink on the panel. 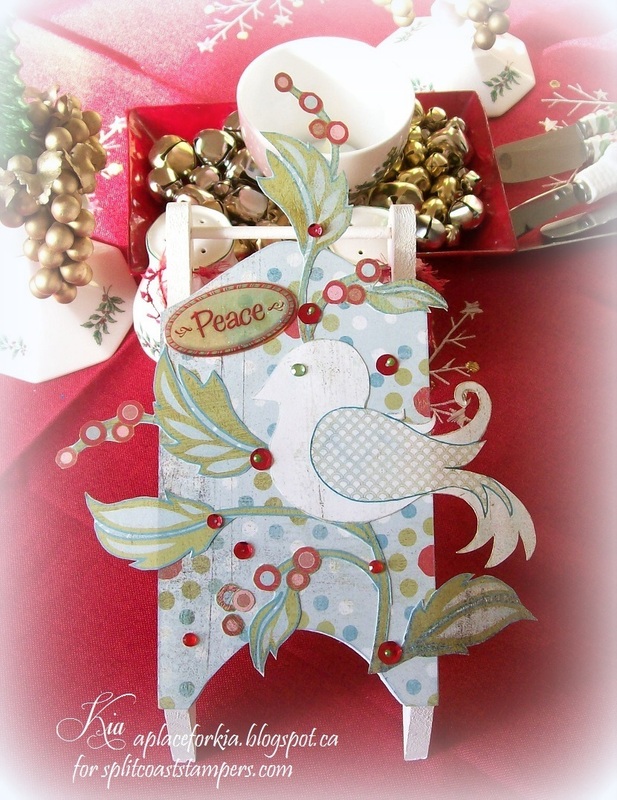 I added the glow to the reindeer's nose, (an idea I saw on Jennifer McGuire's blog) then peeled away the masking fluid and coloured the reindeer with Chameleon Markers. 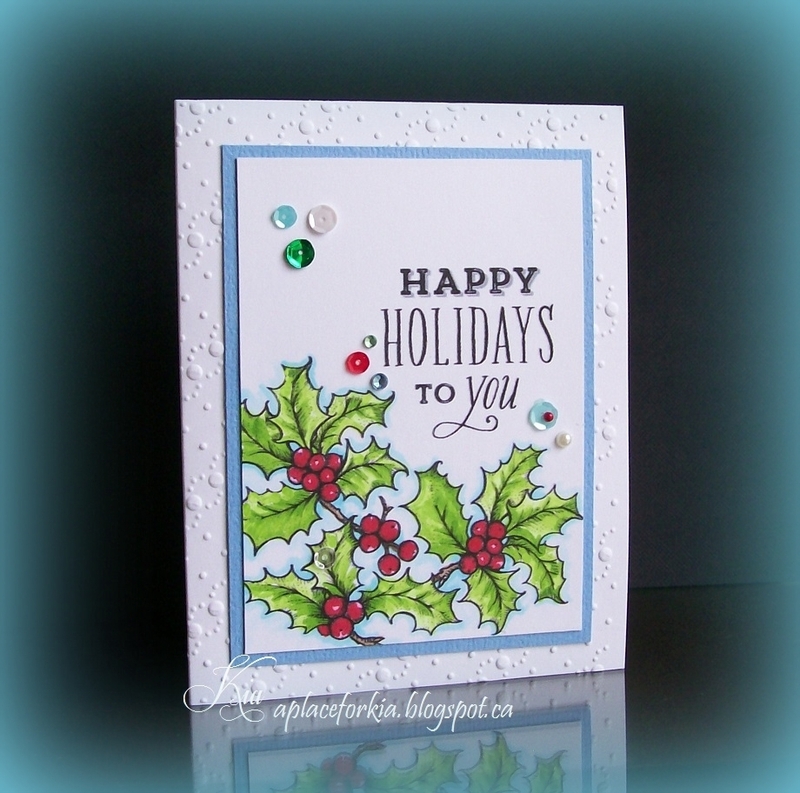 I stamped the sentiment then attached all to the background, which I had embossed using my Sizzix Snow Dots embossing folder. 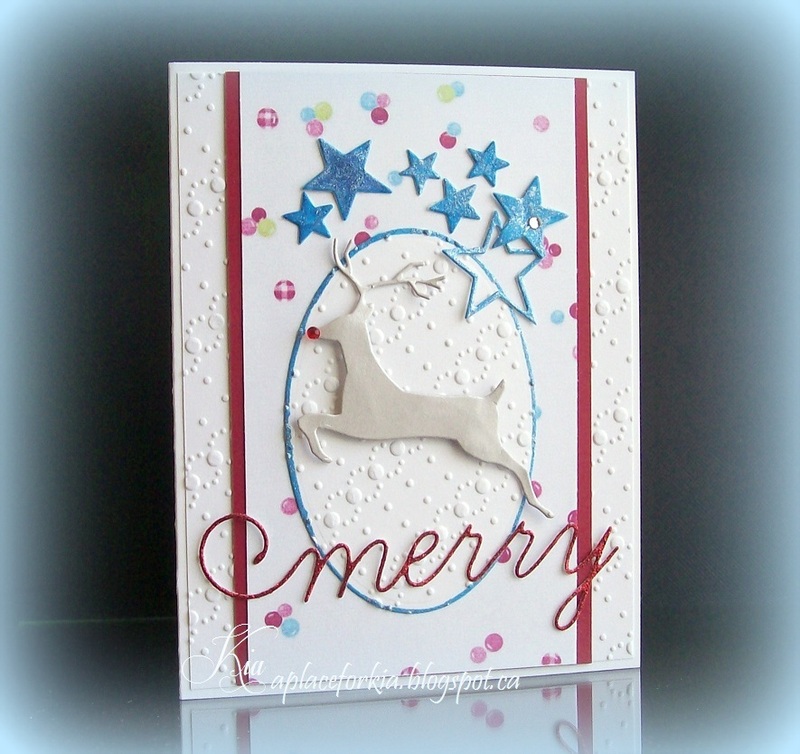 Added some glitter pen to the centre of the snowflakes and a red gem to his nose to finish. Products: My Favorite Things Jingle All The Way, Neat and Tangled Falling Flakes, Sizzix Snow Dots Embossing Folder, Kaiser Gems. I changed my mind, liking this so much I decided to keep it for a friend. 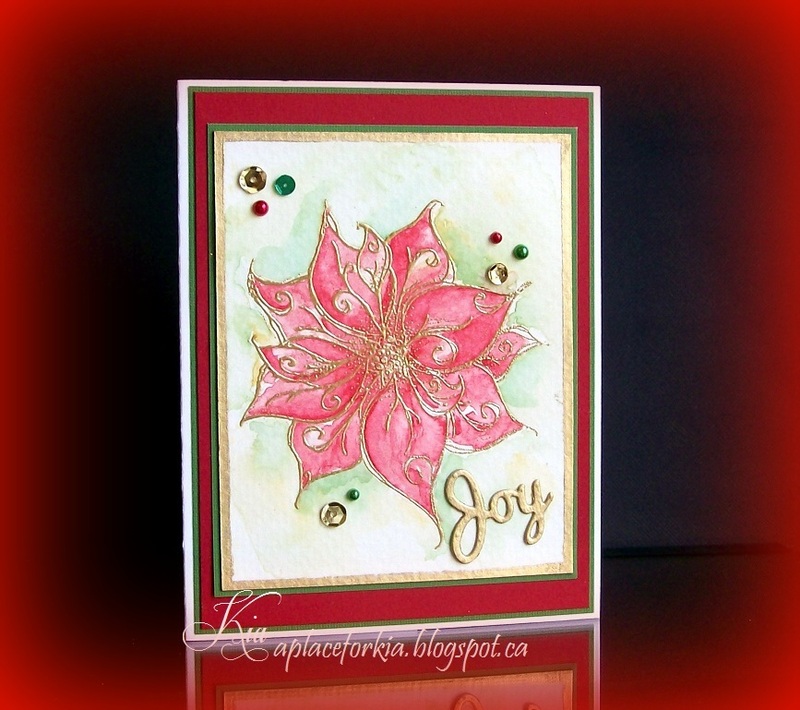 Products: The Stamp Barn Poinsettia, CottageCutz Joy, Krylon Gold Feather Pen, Gold Glitter Pen, Kaiser Pearls and Gems, Martha Stewart Gold Embossing Powder. 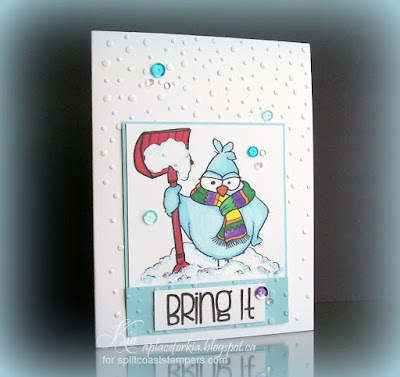 Getting ready for winter over at Splitcoaststampers with the Clean and Simple Challenge. 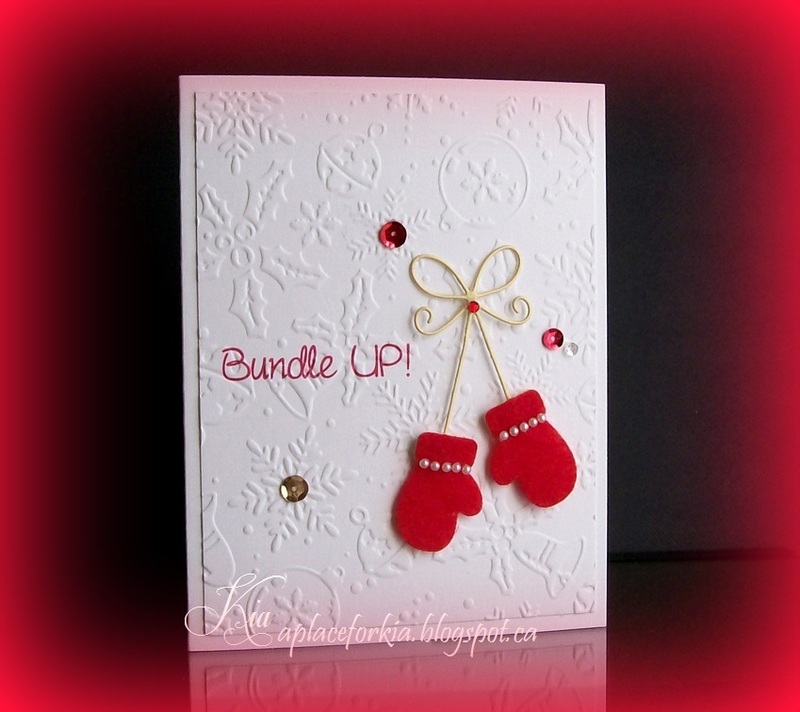 My friend Lesley from Vancouver sent me the most wonderful pair of red mittens from the Winter Olympic Games, and I decided to make my card in honour of Lesley and my warm red mittens, which I love to wear.